Chapel Hill, NC : University of North Carolina Press, 1997. 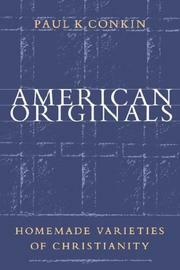 American originals: homemade varieties of Christianity. 100 ME:PersonalName 0 $a Personal name Conkin, Paul K.
245 Title 10 $a Title American originals: homemade varieties of Christianity. 300 Physical Desc $a Extent 336 p.
650 Subj:Topic 0 $a Topical term Christian science. 650 Subj:Topic 0 $a Topical term Christianity. 650 Subj:Topic 0 $a Topical term Jehovah&apos;s witnesses. 650 Subj:Topic 0 $a Topical term Pentecostal denominations. 650 Subj:Topic 0 $a Topical term Seventh-day Adventists. 650 Subj:Topic 0 $a Topical term Unitarians. 650 Subj:Topic 0 $a Topical term Universalists.